Warmer temps = happy Katie. The sun comes out...you get a little bit of a tan...you feel happier and inspired. Inspired to do what, though? To try new flavorful and fresh recipes, pull out the neon skirts/sandals, and to incorporate more colors in your home decor...that's what! Since I gave up pop (or soda to some of you) many, many years ago, I'm always searching for different flavored waters or new flavors of Crystal Light Liquid to add to my water (or for my mixed drinks on the weekends!) Regular water can get boring to drink, who's with me? When Crystal Light asked me to review their new Crystal Light Liquid flavors, of course I said YES! They are a much healthier (and more tasty, in my opinion) option versus pop. 1. Add in bright colors to our deck with cushions, lanterns, chairs, and gardening pots for when we have friends over, or are just enjoying a night out there! and if you want to see the before & after picture-here it is. Such a big difference I'd like to think..
2. To bring the colors inside, I like to swap out our 'winter' pillows with bright, fun patterns for the spring and summer. It's an easy way to brighten up the space. 3. Lastly, I decided I loved the pink + green colors from the Pomtini and Mango Passionfruit flavors so much that I wanted to combine those colors into a work outfit. So, who wants to have a drink with me on our deck? Doesn't that look so refreshing? Oh, and the Crystal Light Liquids are the perfect size to pop in your purse for a night out. If you're looking for some inspiration to add around your home, outfits, or just to get new drink ideas, you can head to their website to get some ideas! Who wants to win a $100 Visa Gift Card? Yeah, me too. But I can't even enter, boo. What inspires you to jazz things up in your home or outfits? This sweepstakes runs from 6/5 - 6/30. Be sure to visit the Crystal Light page on BlogHer.com where you can read other bloggers’ reviews and find more chances to win! These Crystal Light flavors are so good! I have tried a few different ones and so far I have not been disappointed! Your summer couch cushions are to die for and I envy your deck and back yard. It looks so fresh and fun! Love Crystal Light!! Hmmm what inspires me to spice things up? All the coral & mint def makes me happy & want to decorate our whole house in it! Would love to even paint our kitchen cabinets white to brighten the space up even more! 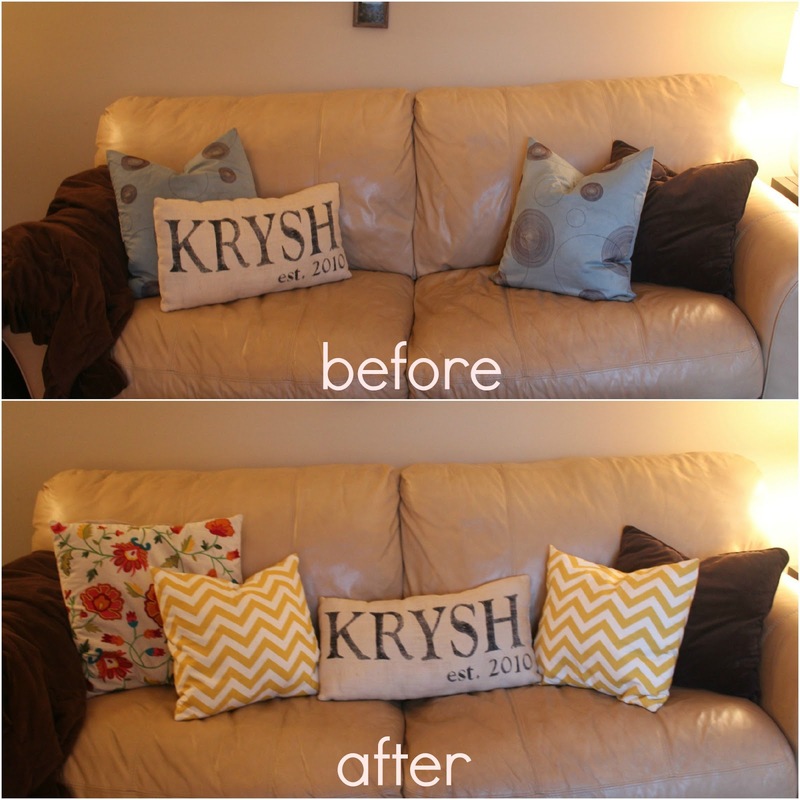 WOW I love those couch pillows. I think I may head to pier 1 this afternoon! I get inspired from nature. I love seeing flowers and green grass and need to bring those colors inside and all around me whenever possible! I love bringing plants and flowers indoors (and outdoors on my tiny little apartment front step) -- something about bringing nature inside with the bright flowers and leaves makes me feel cheerful and summery! Blogs and, of course, Pinterest! I love changing things up each season. I love to spice up my outfits by adding color or updating my fingers/toes with a bright color. Can't wait to make my new patio very bright this summer! Love all the bright colors! And WOW, your deck looks AWESOME!!!! I get inspired by bright colors and patterns. I tend to go for classic looks with a pop of something fun!! I love bright colors, especially in preparation for summer bbq's! best sponsored post i've read in awhile. what's inspired me lately, is floral prints. i can't get enough of it in my summer outfits, and i've been looking for different ways to splash it in my home, too. What a fun post/giveaway ma'am! I get inspired by your blog on a daily basis! I've also been inspired by all the gorgeous flowers and plants coming to life in our backyard.. makes me want to spend much more time out there! Seeing your pics is my inspiration! I love the Crystal Light liquids! 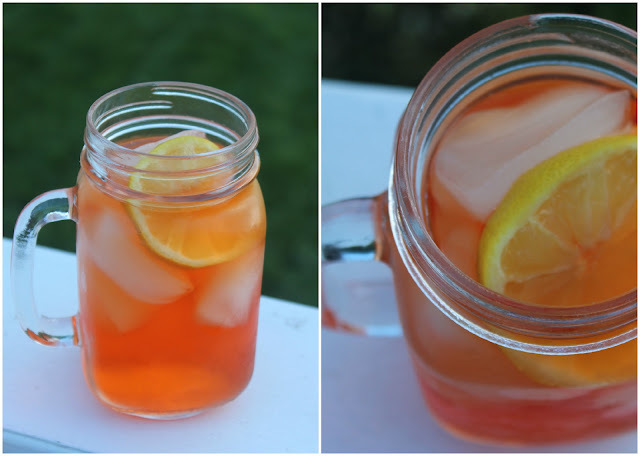 I'm currently enjoying the Iced Tea flavor - yum! I get inspired to jazz things up by nature - in the spring and summer the bright blooming flowers and trees inspire me to add pops of color to my outfits and my home. In the fall and winter, I'm inspired by the beautiful foliage, green pine trees and white winter wonderlands. I'm excited to get rid of the black boring work pants too. Hello dresses and cute sandals. I'm going to need to try this! It sounds delicious! 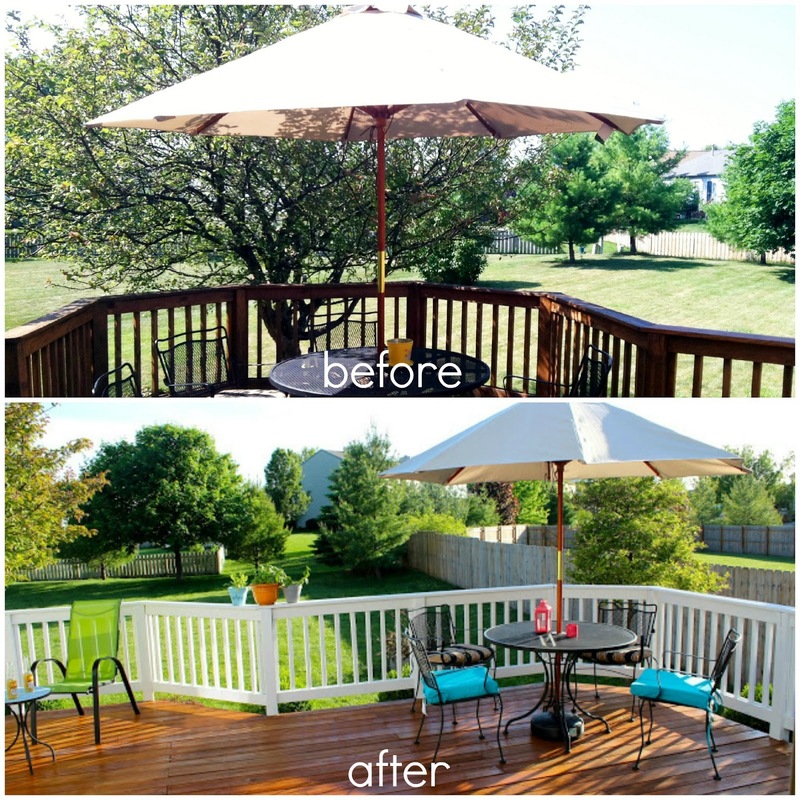 Love the pop of color you gave to your deck! Your summer before and afters are so cute! I really need to try this, because this is about the 7th post I've seen about it. Looks so delicious! Fresh vegetables in warmer months inspire me! Reading your blog and seeing your outfits always make me want to add more color! Definitely Pinterest! It has inspired several of my home decor and outfit decisions! The spring time inspires me. I always want to change my surroundings, at this time of year. I love using bright accessories! Scarves, funky necklaces, or shoes. My wardrobe is pretty classic aka basic, so the accessories help brighten it up a lot. I find color inspiration from home & gardening magazines. Flowers inspire me to jazz things up around the house! I've become totally Pinterest addicted, so I get tons of inspiration there from home decor and fashion photos. guests visiting during the summer make me want to make sure my home looks its best! I take my inspiration from Pinterest, magazines, and outdoors! In the summer I want bright colors! In winter, I want a warm and cozy feeling. I get inspiration from pinterest, blogs, tv (news anchors have great fashion! ), and friends! I am loving the new Crystal Light flavors!! Currently having a glass of their Iced Tea. Being anywhere around the water inspires me this time of year! Beach, lake... you name it - it has me wanting nautical pieces, bright colors, cute bikinis and a good tan! I love seeing the colors from flowers and nature! Pinterest inspires me the most recently, so many great and doable ideas to find. I also love home decor ideas from Restoration Hardware stores. I usually find inspiration on blogs or Pinterest! My moods, those of my children and my environment inspire me! Some days I feel bright and sunny so wear more dramatic colors and others I feel tired so tend to wear more pastel shades. Of course when the sun is shining I find myself wearing much more vibrant shades as well. Pinterest gives me so many ideas for home decor and fashion. I get inspiration from magazines. Seeing ideas on tv or magazines inspire me. I have to say that I get inspiration from magazines, Pinterest, and a montage of how I think the room would look good. For decorating inspiration, it's blog posts like this that inspire me. I'm inspired by looking at pictures in magazines. They are really full of good decorating ideas. I like variety so I'm often looking for new looks. Follow Pinterest mags and google a lot. The seasons inspire me to change it up. The thought of traveling on a vacation inspires me to try out a new look. I love the summer colors and clean look. Makes me want to freshen up my house. Watching HGTV inspires me to jazz up my home. Inspiration is everywhere. I saw a hand painted photo frame that had such wonderful colors I had to use it as a theme to redo the guest room. I love to change up the paint color on my walls every couple of years. Celebrities and movies inspire me! Pinterest, I could spend hours and hours on there looking up or seeing great ideas I want to try! My handbag & earring collection. I love bright colors and fabrics for summer! oops my email is hillhouserock (at) GEEmail thanks! I get inspired by art, fashion and nature, and I get bored quite easily with the same old stuff all the time. I get inspired from friends and magazines. Special earrings jazz up my outfits. Wanting to be more organized. Seeing all the new summer clothes out in the stores.